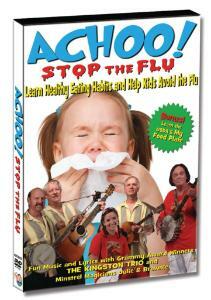 Learn Healthy Eating Habits and Help Kids Avoid the Flu! Fun Music and Lyrics with Grammy Award Winners The Kingston Trio and Minstrel Magicians Julie & Brownie. Join the Grammy award winning Kingston Trio along with their guests Julie and Brownie for a song filled program as kids learn how to avoid colds and flu and develop healthy eating choices that will last a lifetime. Five brand new songs, easy to learn on screen catchy lyrics and plenty of comedy and laughter illustrate healthy eating habits, washing hands and good exercise. Julie also explores what's in our food and how to prevent flu and colds by easy to remember basic germ prevention techniques. Bonus! Learn about the new USDA My Food Plate - and how we need to eat right to stay healthy. An ideal program for parents and children everywhere, schools, kids groups, churches, hospitals and health organizations to teach proper preventative health and nutrition. Bonus Features Include: Compares health benefits of bottled soda and water. Reveals the sugar and other sweetener content in popular soft drinks. Includes Healthy Living Resources and Sheet Music Links. Encourages sing-a-long participation, karaoke style. About the Kingston Trio: Grammy award winning The Kingston Trio is Americas favorite folk group. Through changing times they've played on - great songs that sound as good as today as the first time you heard them! And fifty-four years after Tom Dooley shot to the top of the charts, the Trio is still entertaining us bringing back great memories and making new ones. About Julie and Brownie: The Julie and Brownie Show has been delighting family audiences in person and on radio and TV since 1991 in the USA and Canada. Their children's songs and educational messages have earned critical praise and awards. They have written two children's books, The "Streamlined Double Decker Bus," and "A Pirates Life For Me." Especially Suitable for children ages 4 - 12 / All Audiences.